If this postcard was part of a series, the next one likely involves bruises, scrapes, tears ... and possibly much worse. His Christmas might not be "joyful." 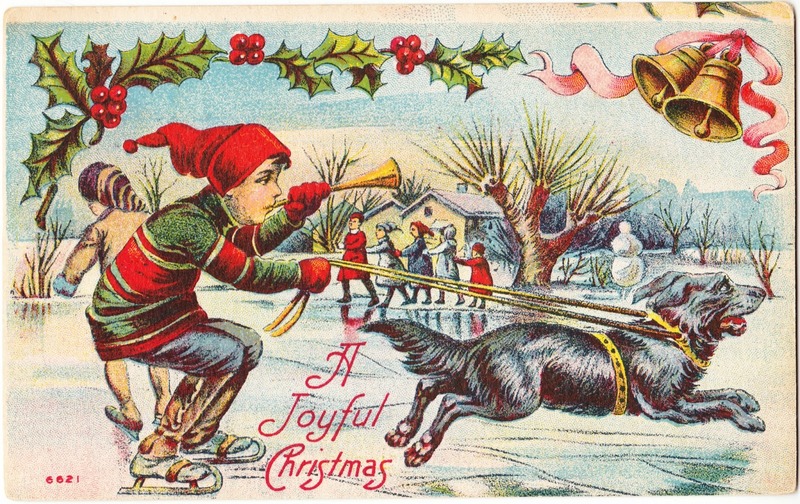 There are a lot of good details on this vintage card, such as the snowman, the chain of beginner skaters, and the boy's multicolor shirt. Also, the tree closest to the forefront looks a little odd, doesn't it? Sadly, there is no artist listed, nor is a publisher for this postcard noted. It was never mailed. The stamp box on the back calls for a one-cent stamp in the United States, which still allows for a wide range of years of publication.